Cycling tourism contributes nearly $377 million annually to Montana’s economy. Leigh Ann Valiton watched a customer meander the aisles of the Blackfoot Commercial Co. in Ovando, Montana. Valiton’s store, and attached inn, is open until seven every evening, but it was 10 p.m. and she showed no sign of leaving. The customer, Faye Cunningham from New Zealand, filled her basket with frozen burritos, energy bars, chips and a Mountain Dew. Cunningham was competing in the Tour Divide Race, a 2,735-mile long mountain bike race that stretches from Banff, Canada, to the Mexican border. The route enters Montana in Glacier National Park and meanders south, paralleling the Continental Divide. 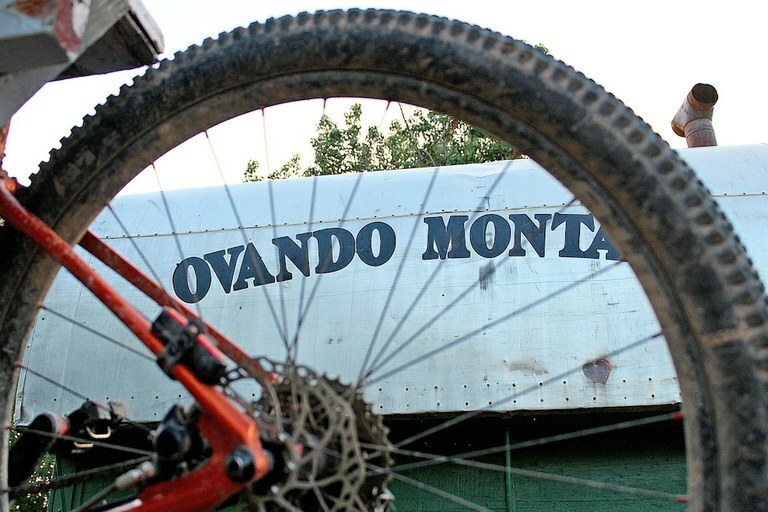 For the last five years, Ovando has become known by the cycling community around the world as a place to stop and sleep, refuel and chat with the locals. “I’ve been a groupie (of Tour Divide) for years so it’s cool to see the places I’ve read about — Richmond Ridge, Holland Lake, here,” she continued. Cunningham had ridden for 16 hours and wanted to make it to Ovando before she stopped for the night. An old sheep wagon welcomes cyclists to Ovando, Montana. Now, nearly a thousand cyclists from around the world pass through the town of 50 residents every year. In addition to being a waypoint for the Tour Divide Race, the town on Highway 200 sits at the intersection of two popular cross country cycling routes. Schoendoerfer recalled the first time the community banded together to support bicyclists. It was in 2012, when a TDR rider, Tracy, was inbound to Ovando. Someone phoned ahead, letting the town know Tracy was having a rough go of it. Only the sheep wagon existed back then, but the townsfolk put out a sign telling Tracy to rest up and left food, drink and moral support. Since then, the town has actively courted the two-wheeled tourists. One small corner of Schoendoerfer’s fishing shop is dedicated to cycling gear — tires, tubes, lube, pedals, the essentials. The Ovando Community Fund was started from donations and provided money for the teepee, jailhouse and outdoor shower system riders can use. Each year riders donate around $500, Schoendoerfer said. Sometimes it’s change (Canadian), sometimes it’s a can of beans if that’s all they have. It’s enough for the town to know they’re having an impact on their visitors. Kathy Schoendoerfer and Randy Neil chat in front of the Schoendoerfer’s store, Blackfoot Angler. Neil is riding in his third Tour Divide. That impact goes both ways. According to a 2014 study by the University of Montana, cycling tourism has a substantial impact on the state. The study, conducted by the University of Montana Institute for Tourism and Recreation Research looked at the effect of bicycle tourism statewide. It found that the industry contributed nearly $377 million annually to Montana’s economy. Of the nearly half million bicycle tourists who visited the state, the average cyclist spent around $75 a day and stayed for at least a week. For rural communities, that kind of expenditure can greatly increase viability and towns are learning how to capitalize on it. A hundred and fifty miles south of Ovando, another small Montana town shows up on cycling maps, at the intersection of the Lewis & Clark and the TransAmerica Trails. Twin Bridges is home to almost 400 residents and the nation’s first ever Bike Camp. Bike Camp sits in Jessen Park, on the edge of town. It’s a simple wooden building complete with a shower, toilets, tables and chairs, a sink and grill and plenty of space outside to pitch a tent — but only for visitors arriving on two wheels. White developed a proposal for Bike Camp, got a building permit and raised $9,000 for materials. The town broke ground in April of 2009 and the camp was ready by June. In the first year, around 300 riders used the camp. White said that by July of the second year, the number of visitors was already up by more than 50. Cyclists riding the Continental Divide trail wash off their bikes outside a motel. Cyclists rely on small communities for lodging and other amenities such as laundry and other services. Adventure Cycling is a national cycling advocacy group (“America’s Bicycle Travel Experts”) that boasts 53,000 members. The company organizes guided bike tours and maps out the more than 46,000 miles of cycling networks in the country. A portion of their work is teaching communities how to become bike friendly, and its website offers pages of resources. Crawford has spent years investigating how cycling can save rural economics. In addition to her work for Adventure Cycling, she founded the travel website The Path Less Pedaled. She makes a comparison between a cyclist and a road tripper and the impact they have on communities during a trip. Using a 200-mile stretch of road as an example — roughly the distance between Whitefish and Helena — Crawford breaks down the differences. For a vehicle, that trip is a mere afternoon’s travel. A road tripper’s itinerary traveling city to city might only include a stop at a gas station or a lunch break in the middle and skip most of the small towns in between. White, who passed away in 2012, saw firsthand the effect of riders on his town. When Crawford pedaled through Twin Bridges to profile the town and the Bike Camp in a video, she was struck by White’s foresight and determination to make the camp happen.